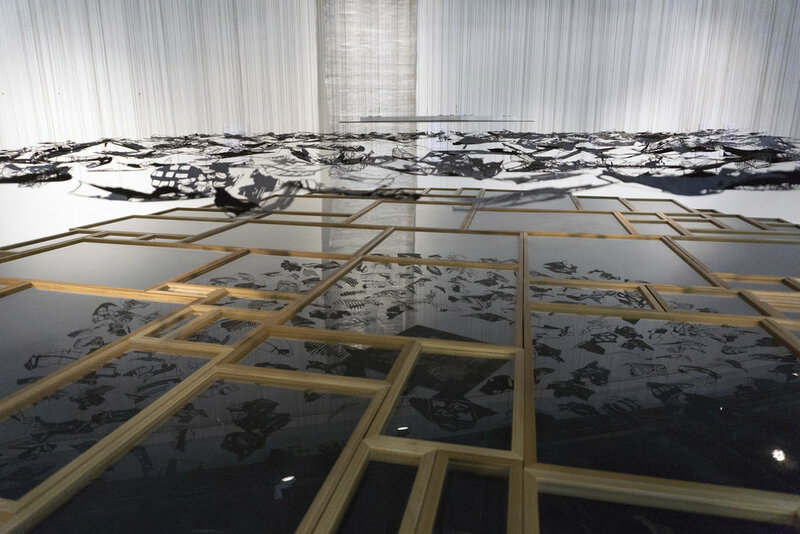 In the multi-dimensional installation, Fragmented Substance, tension lingers between the wholeness of lived experiences and the fractured and straining nature of memory and recollection. 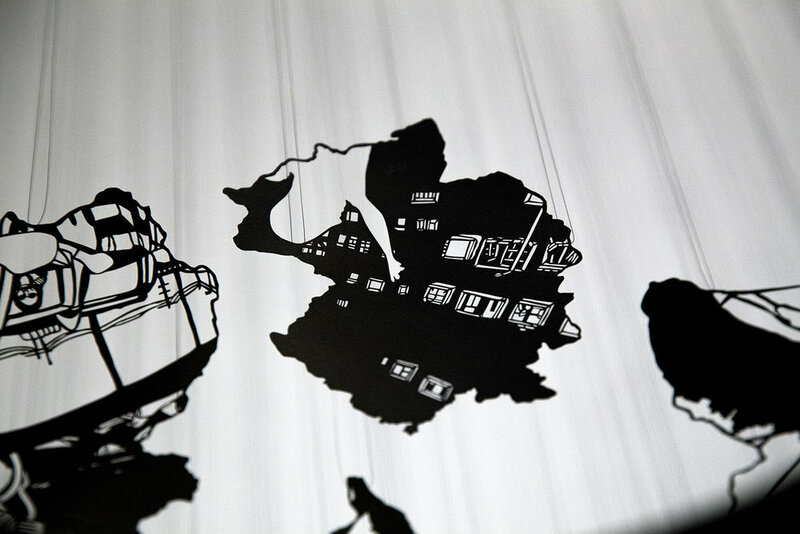 Hung by threads floating parallel at eye level, black cut paper reveals moments of the artists’ larger personal immigration narrative. The parallel hanging pieces demonstrates a universal equalizing of experiences while accentuating their difference as various contexts hang side-by-side. Too flat to be observed directly, viewers must rely on the reflection of glass frames that resituate the objects, places, and characters in a newfound relation to one another. Moreover, each visual experience is completely unique as the installation makes it impossible to view another’s experience of the work. Once bound by an individual’s experiences in their original context, the stories are now fractured. Amongst the paper subjects, notions of ‘home’ and ‘foreign’ compel one another and are re-framed side-by-side within a shifting, though singular, field of visibility. 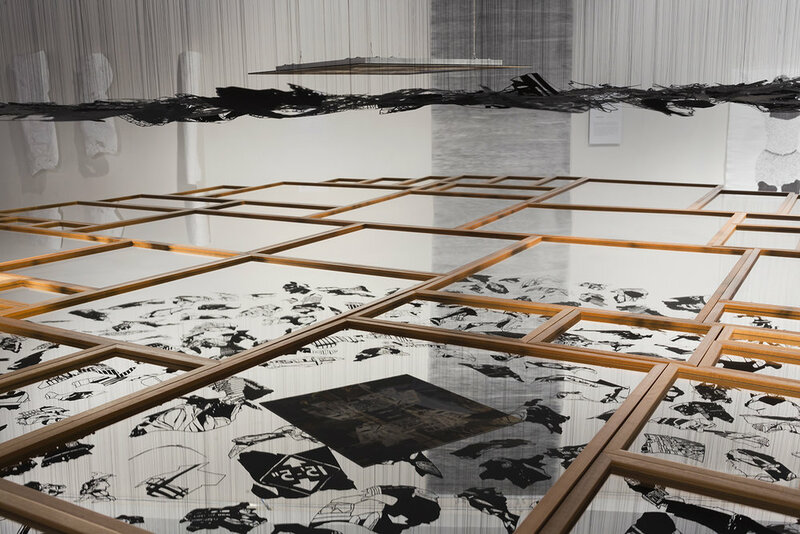 Throughout the various narratives employed by the artist, commonalities of war, destruction, and immigration press on the universal experiences of loss and need for a sense of personal belonging. The overlapping, floating memories allow for free associations and connections to be made by the viewer. New narratives are forged out of the old by viewing a multitude of possible narrative combinations within the reflections. Like memories, the hanging works shift between visible and invisible based on perspective. While historical, political, and personal places come together in Fragmented Substance, there is an inability to view the image all at once. Simultaneously, there is a desire to allow the perspectives to culminate into a single narrative, and yet the inability to comprehend an absolute and coherent reality.